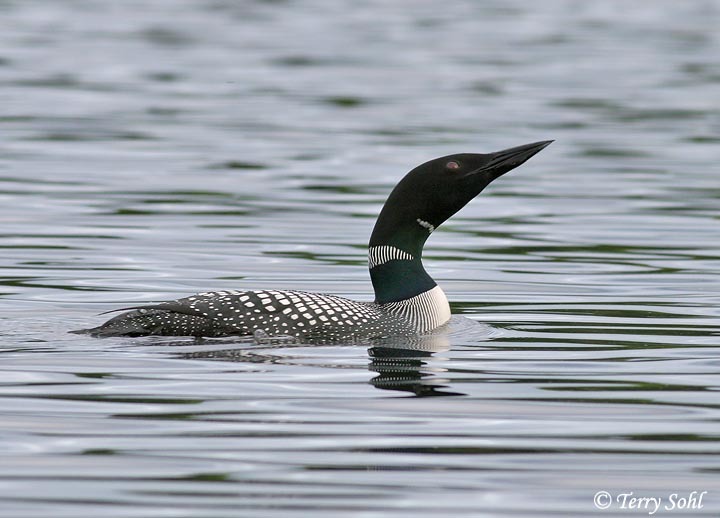 The loud cries of the Common Loon are famous. However, they are only a migrant in South Dakota, and are generally silent as they pass through the state. Birds seen in the state may be seen in full breeding plumage (particularly during the spring migration), or in winter plumage. Occasionally a Common Loon will over winter on a larger open water body in the state, particularly A bird in breeding plumage is shown to the right. Other photos, including those of birds in winter plumage, can be accessed below. 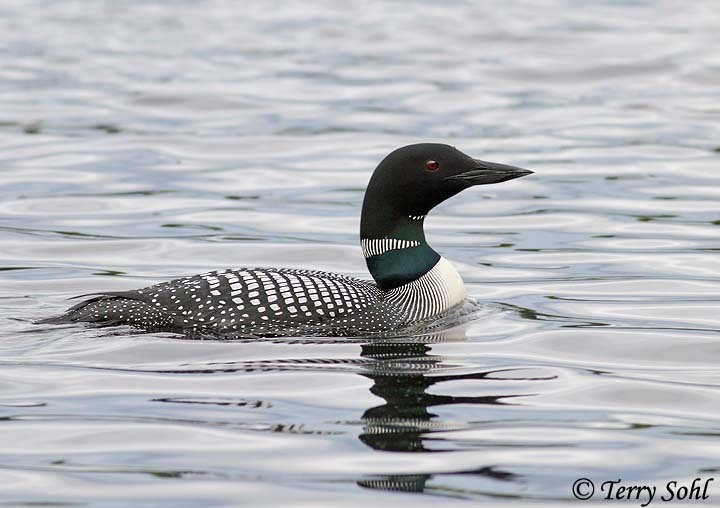 The Common Loon is also famous in cinema! The wild-sounding wails of a Common Loon have long been a favorite for Hollywood sound editors, with the Loon's cries heard in a variety of situations, regardless of whether it's suitable Common Loon habitat. A personal favorite...listen closely to the end of Avengers: Infinity War. When Thanos snaps his fingers and destroys half the life in the universe and retreats to his peaceful planet to farm, a Common Loon's wail is clearly heard as he overlooks an alien landscape. 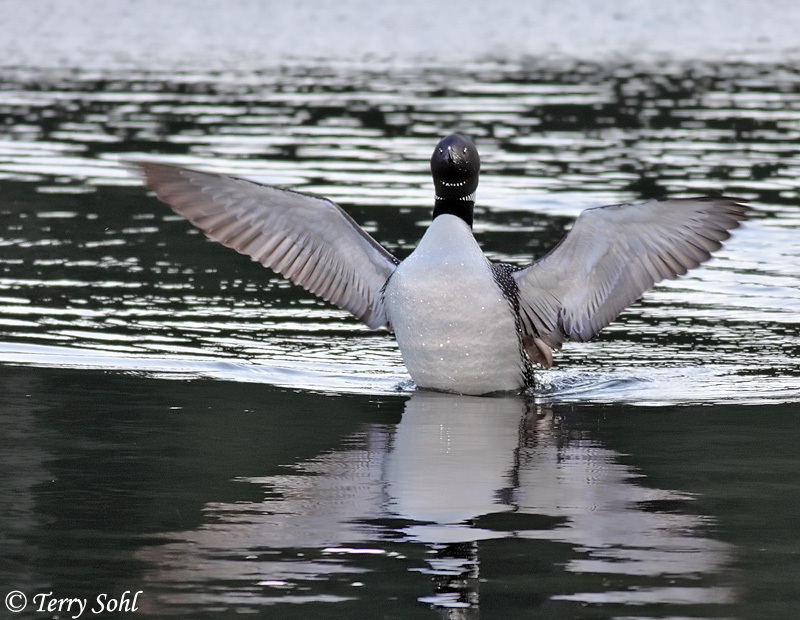 Common Loons have gone not only international, but interplanetary in the movies! Other noted movies and TV shows with Common Loon cries include Game of Thrones, On Golden Pond (actually an APPROPRIATE use! ), Out of Africa, Murder She Wrote, and Raiders of the Lost Ark (presumably while in Peru!). Large lakes, coastal waters. Prefers large wooded lakes or tundra lakes in summer, winters on coastal waters. Mostly fish, Also aquatic insects, aquatic plants, frogs, crustaceans, and leeches. Forages underwater, diving below the surface and using its feet to propel itself. They will often partially submerge their heads in search of prey before actually diving. Other than breeding pairs during the summer and loose nighttime flocks, Common Loons are often fairly solitary birds. Non-breeder in South Dakota. 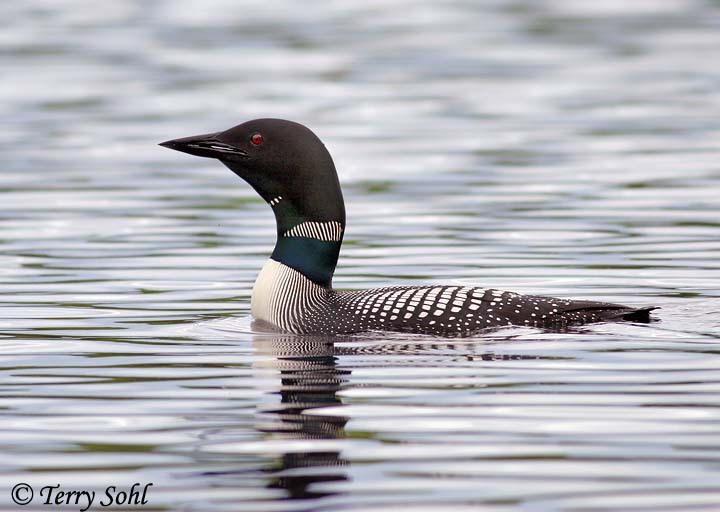 On their breeding ground the Common Loon builds it's nest on the shoreline of a lake, typically next to deeper water. This enables the parents to approach the nest from underwater and not give away nest location, and also offers an ability to rapidly depart if disturbed, given they are extremely clumsy on land. The male selects the nest site, with both parents helping to build a mound of vegetation along the shoreline, usually from wetland vegetation. A shallow depression is made in the middle of the mound, and the female lays between 1 and 3 eggs. Both parents incubate the eggs, which hatch after about 4 weeks. The young leave the nest within a day or two after hatching, with a parent protecting them. They are sometimes seen riding along the back of a parent. 2Click here to hear the wailing cry of a Common Loon, recorded in Wisconsin. Note the Loon vocalization is intermittent in this recording, with pauses in between where other birds may be faintly heard. 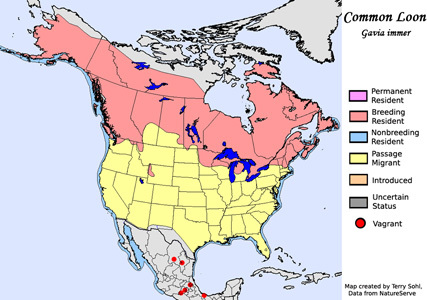 Summers in Canada and extreme northern U.S., winters along North American coasts. 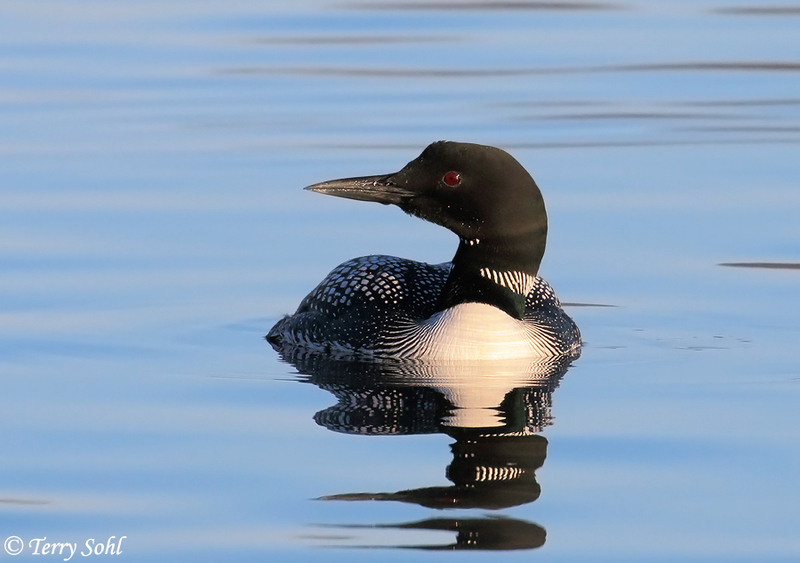 There are some indications that the Common Loon may have historically bred in northeastern South Dakota. However, northern Minnesota is now the closest breeding location. Birds seen in South Dakota may be seen in full breeding plumage, particularly as they migrate through in the spring, but also in summer for some post-breeding birds. 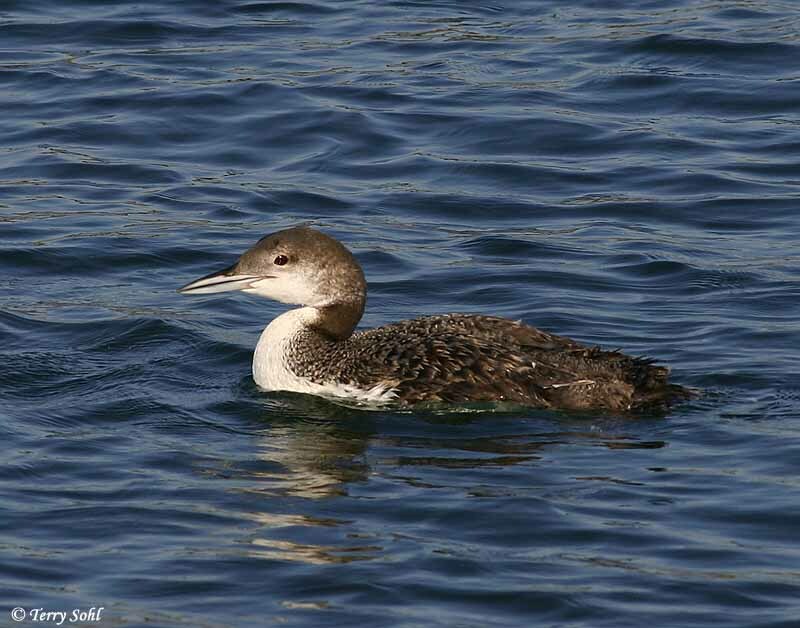 Yellow-billed Loon - Of the loon species that could be seen in South Dakota, Yellow-billed Loon has a summer breeding plumage most similar to the Common Loon. The bill is a dead give-away though, as the Yellow-billed Loon has a much larger and yellow bill, while the Common Loon's is black. 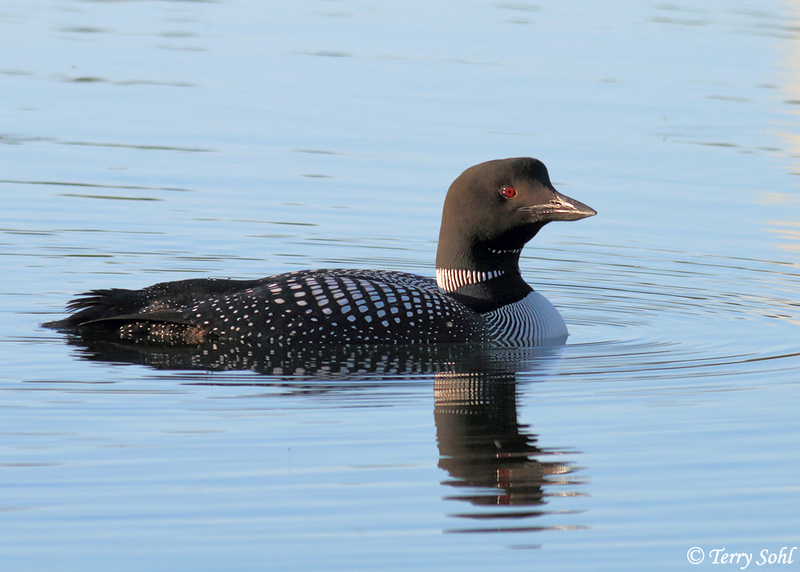 In winter plumage, the larger bill of a Yellow-billed Loon is still apparent if seen well, and the bill is paler than a winter-plumaged Common Loon. Red-throated Loons - A loon, but in summer plumage they are easily distinguished from Common Loon. 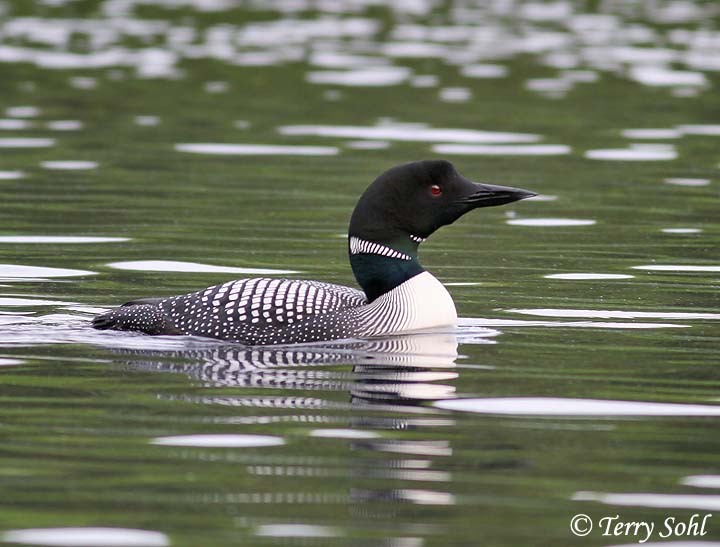 Plumage patterns are completely different, as the Red-throated Loon has (not surprisingly) a red throat, a thin dark bill, a mostly black body (lacking the Common Loon's checkerboard), and vertical stripes on the back of the neck. 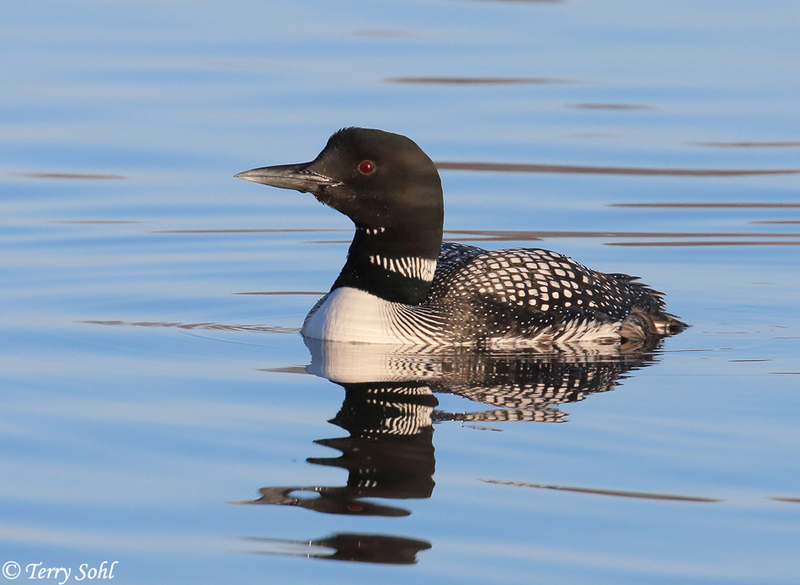 Winter plumage is more difficult, but if seen well, the bill is thinner than a Common Loon, they have more white on their face and front of the neck, and the back has more of a pattern than the winter-plumaged Common Loon. 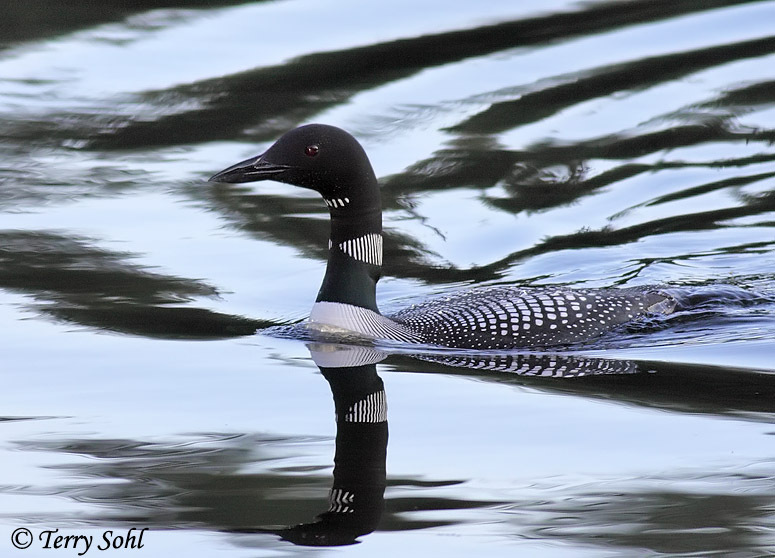 Pacific Loons - Summer plumage is distinct compared to a Common Loon. The head is a slate gray with a black throat and vertical stripes on the neck, while the back has more black and less of an area of a checkerboard pattern. 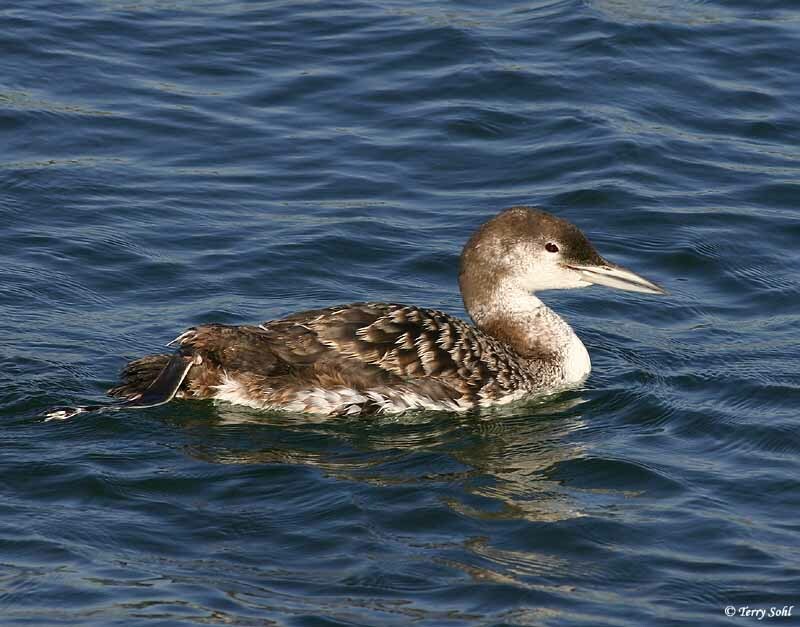 In winter plumage, a Pacific Loon has a stockier looking head and neck, and a cleaner straight line between a white throat and darker back of the neck, while the Common Loon has more of an irregular break pattern between dark and light on the neck. Some decrease in numbers in southern parts of summer range due to human disturbance, and water quality decreases. 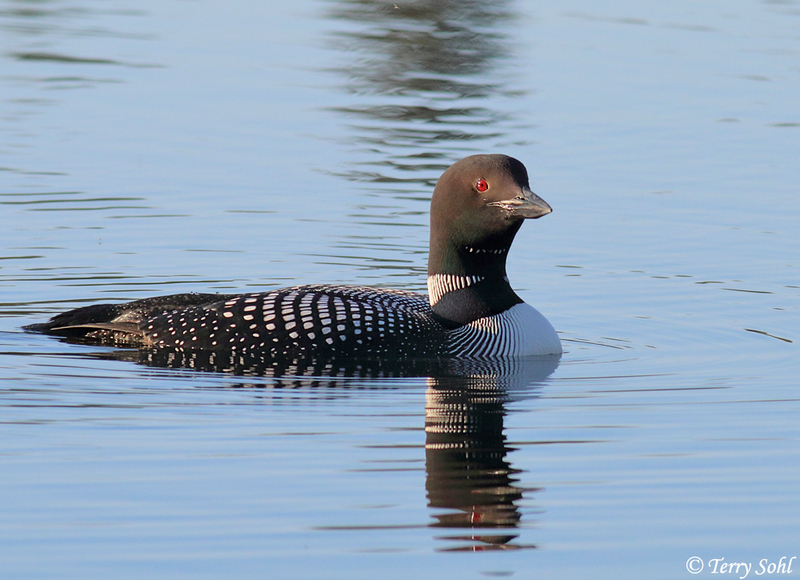 Common Loons are a good "indicator species", being quite sensitive to water quality. However, overall populations are very strong, they are common in parts of their range, and they are found across an extremely wide geographic area. 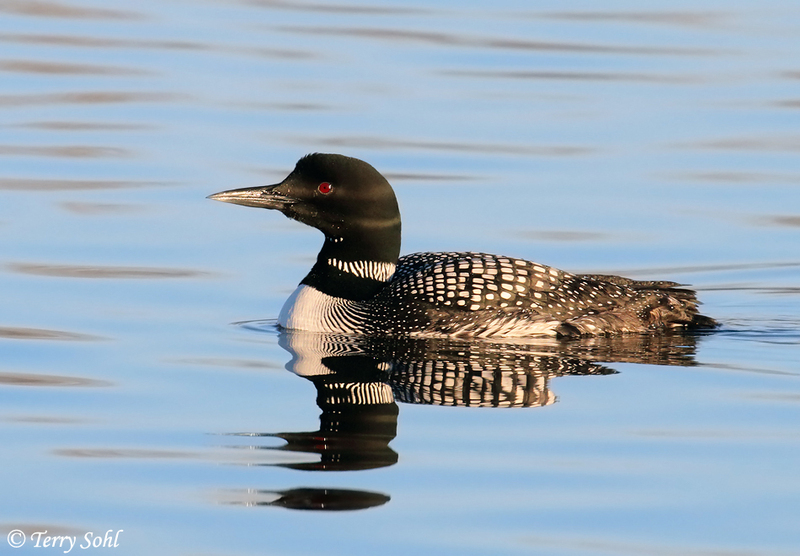 The IUCN considers the Common Loon to be a species of "least concern". The Missouri River below Oahe dam often holds Common Loons during migration. Occasionally, nonbreeding birds can be found there in the summer as well. Waters below other Missouri River reservoirs in the state are also good spots to find them during migration. 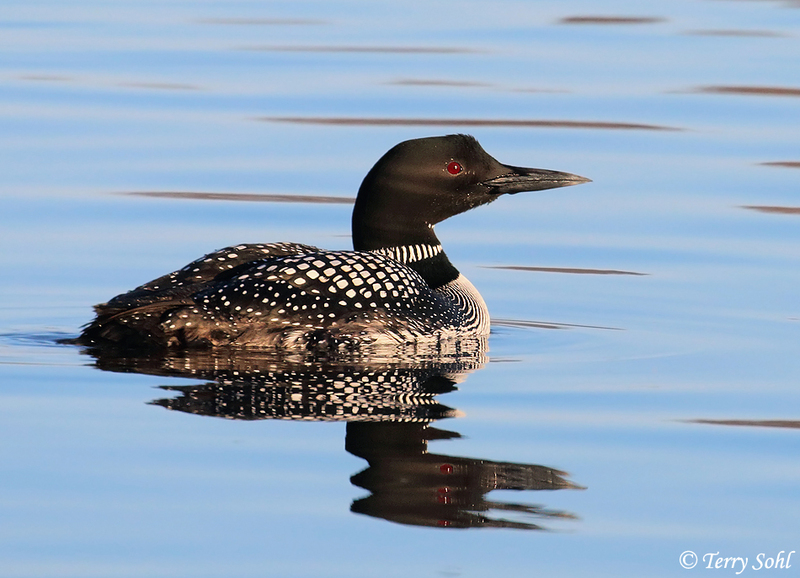 Closer to Sioux Falls, Wall Lake is often a good spot to find Common Loons during the spring migration. Click on the image chips or text links below for additional, higher-resolution Common Loon photos. South Dakota Status: Uncommon migrant throughout the state. Occasionally nonbreeding birds are seen in the summer.